A sheepdog has crashed a tractor in a busy motorway in Abington, South Lanarkshire, UK, during Wednesday rush hour after leaning on the control panel. Four-and-a-half-year-old Don the collie jumped on to the vehicle as its owner farmer Tom Hamilton, 77, was busy with a lamb in a field next to the M74. 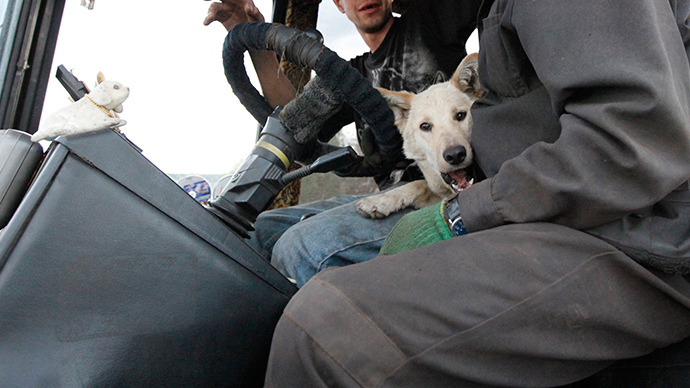 The dog leaned on the controls, setting the vehicle in motion. The tractor broke through the farm fence, drove across the highway and ground to a halt upon hitting the median strip. "I was out in the mini tractor and had stepped out of it to get a lamb which looked like it was about to get out of the gate. I had not put the brake on the tractor and when I turned round I got a fright as the vehicle was careering down the hill, through a gate and on to the M74," Tom Hamilton, who has run the farm for more than 50 years, said. He also added that "Don was fine and did not bark during the incident." A Traffic Scotland spokesman said "The dog accidentally leaned on the controls and the vehicle made its way out of the field and on to the M74. Nobody is believed to have been injured."